To XTrac Or Not To XTrac, that is the question! SiRF is something that most people are aware of but don't exactly know what it means. SiRF comes as the main chipset in GPS chips which drives how you receive signals from the satellite. Whether it tries to look at all 12 in view satellites, or whether it discards the weakest signals and goes for the stronger signals. As of the date of writing this article, the SiRF chipset has gone through a number of incarnations. Firstly we saw SiRFstar, SiRFstar I, SiRFstar II, SiRFstar IIe, SiRFstar IIe/LP, SiRFstar IIt, and recently SiRFLoc and SiRFXTrac. The latter one is what we're really interested in this article, as it provides a great performance increase over previous GPS Receivers using the older SiRF chipsets. Yes, okay but I use NMEA, why do I want to know about SiRF ? The reason is that NMEA is a protocol that is used to talk to the GPS Receiver. SiRF is both a chipset and a protocol, allowing you to talk directly to the chipset itself giving you greater control over the GPS with features such as trickle mode for Low Power consumption. The standard in performance and flexibility for high volume GPS chip sets. The SiRFstarIIe was the first product to use the SiRFstarII architecture - setting the standard for GPS performance. It features 1920 time/frequency search bins, integrated WAAS, EGNOS, DGPS, and an ARM CPU integrated into the digital chip. This benefits users with fast, accurate GPS that is flexible enough to integrate user tasks on to the processor. This flexible platform supports a wide variety of consumer GPS devices. The new lower power standard for high volume GPS chip sets. If you're manufacturing or designing a device using GPS with battery power, the SiRFstarIIe/LP provides an innovative way to add location awareness to your product. Drawing only 60mA in full power and 20mA in TricklePower, the SiRFstarIIe/LP is one of the lowest power full-feature GPS chipsets on the market. The chipset also has an ARM CPU with 40 MIPS of total processing power. This can be used as the engine to drive your product reducing component cost by removing the extra CPU. The SiRFstarIIe/LP family is comprised of the GRF2i/LP low-power front end, the GSP2e/LP highly integrated digital section, and the GSW2 software, which provides a path for new features and continuous GPS improvement. 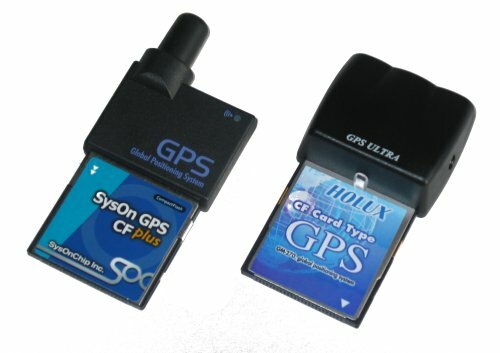 The host-based GPS chip set solution. SiRFstarIIt makes it easy and economical to add high-performance SiRFstarII technology to systems that are based on many popular processors and operating systems. The SiRFstarIIt solution allows GPS function to be added at minimal cost in components and circuit board area, by sharing the host system's processor and memory resources. The chip set acquires and tracks satellites, then sends raw measurements to the host processor running the SiRFNav software in parallel with the host applications. The SiRFNav software module computes position time and velocity. For enhanced accuracy and navigation reliability, WAAS corrections can be applied to GPS measurements or GPS can be combined with dead reckoning data and processed by SiRFDRive software. The chip set consists of the GSP2t highly integrated digital chip, GRF2i integrated RF receiver and the SiRFNav software. The two chips are packaged as 9mm 48-pin LQFP packages and require minimal external components thanks to their high level of integration. SiRFNav software is designed for easy porting to host systems. The worlds first A-GPS Multimode technology enabling E-911 and LBS platforms. With the potential of Location Based Services (LBS) and the requirement to meet the enhanced 911 (E-911) mandate, the importance of implementing a location solution is on the increase - for service providers and handset manufacturers alike. Designed to provide the most flexible and effective location solution available for wireless applications, SiRFLoc is the worlds first multimode Aided GPS (A-GPS) solution. Autonomous high-sensitivity software designed to extend the range of GPS. Complimenting SiRF's existing product line of GPS solutions, SiRFXTrac is a high sensitivity GPS software solution. 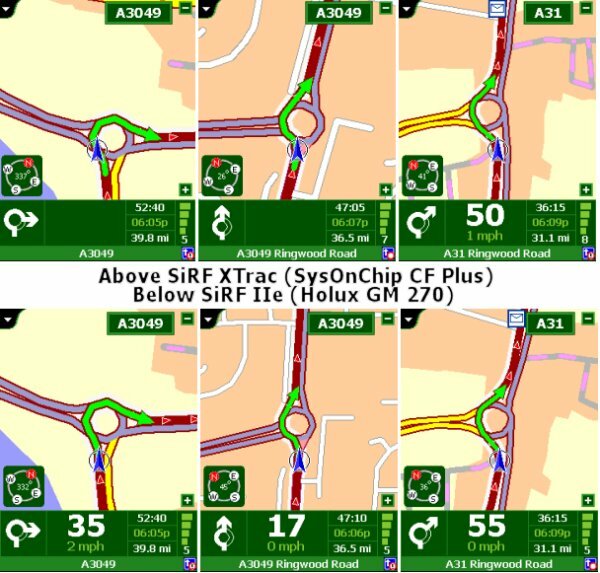 SiRFXTrac extends the operating range in which GPS can be used - dramatically increasing the versatility of GPS-enabled products such as personal digital assistants (PDA's), automotive navigation solutions, AVL applications, and other location aware consumer devices. If loaded with SiRFXTrac high sensitivity software, GPS-enabled mobile consumer devices will be able to continue operating in far more locations than ever before possible. Hopefully that gives a little more insight into the various SiRF chipsets available at the time of writing this article. How do conventional GPS Receivers operate ? So I now understand that SiRFXTrac gives high sensitivity, but what does that translate to me and my GPS Receiver ? When you switch on your GPS Receiver, you will see a maximum of 12 satellites (12-all-in-view) out of around 28-29 Satellites that are live and orbiting the earth and fully functional. You don't see the remainder 16-17 satellites because they're physically out of view. They're probably on the other side of the earth from where you are at present, so you don't physically have a direct line of sight to these satellites. When we say direct line of sight, it doesn't mean that you can see them, but it does mean that you signals cannot be rebounded off of other objects like the sun, the moon, other satellites which aren't GPS. On an average day, many people will see themselves getting between 5-7 sats on average. You may only get 3 or 4, or you may get 8 or 9 sats. On a good day, if you're positioned correctly at the right time of the day, you can get to see a 11 or 12 sat fix, but it's fairly rare, the average is usually 5-7 sats. What the current SiRF chipsets do is hunt out the satellites and can quickly tell which satellites are being received weaker than others. When a satellite is high in the sky (e.g. above you) then you will get a very strong signal from the satellite. When a satellite is low on the horizon, it has a greater chance of having it's signal reduced by the earths ionosphere, and other objects that line the horizon like trees, buildings etc. Normal GPS Receivers will hunt out the stronger signals and discard the weaker signals, so if you have 4 strong signals, and 3 weak signals, then the 3 weak signals will usually be discarded. The XTrac software/firmware basically acquires a fix on the stronger satellites first, but then continues to attack the weaker satellite signals to build a bigger picture, and works hard at bringing in a fix for the weaker satellites. This means that TTFF time can be extended in some cases or continuous, and due to this you may experience a brief lag on a map depending on the software you use when you are using your GPS Receiver in XTrac mode. But why bring in more satellites that are weak ? Well if you're in heavy foliage or in a covered car park, you will probably not be able to receive a fix. If XTrac can sniff out the weaker signals and over time give you a better fix, then when you are under cover you may still be able to receive a fix. It's all about sensitivity. Does my GPS Receiver have XTrac mode ? At the time of writing this article, probably not. Firstly check out the technical specifications of your GPS Receiver, but at the moment there are only a small amount of GPS Receivers that support XTrac. The SysOnChip CF Plus does support XTrac, as well as the Holux GM-270 Ultra. Not all GPS companies list XTrac in their technical features of their product. SysOnChip are one company. The problem is XTrac can be a great advantage if you're in a location where you are experiencing signal difficulties, but on the flip side, it can be seen as a downgrade if you are going to see lag when driving. So what is XTrac ? XTrac is a firmware on the SiRF chipset that will boost the sensitivity of a GPS receiver. It does so by acquiring more signal from weaker satellites before it calculates your position. For example, a normal GPS will acquire signals from 4 satellites with the strongest signals to calculate your position. In the XTrac mode, the GPS will acquire signals from 2 more weaker satellites (total 6 satellites) before outputting a position. So Sensitivity is good ? Yes and No. Sensitivity can be good from the point of view that you need to sometimes bring in more satellites to get that all important 3D fix. However, you can experience some position problems on a map. As XTrac is constantly bringing in signals from weaker sources, this is good because it gives you a greater sat fix, but what in-fact it is doing is bringing in weaker signals which may not contain as accurate data as some of the stronger signals you are receiving from other satellites. Some people have experienced problems with Street Routing programs like TomTom Navigator 2. What you have to understand is that these sorts of applications cheat in positioning you to a road. What they do is see that your position is maybe 15 feet away from the road, do a quick check to see if other roads are in the location, and it will then jump to what it thinks is the closest road compared with the position (co-ordinates) you are receiving. Normal SiRF I/II receivers can get this wrong sometimes when there are a lot of roads within 15-20ft, especially on housing estates, but you won't necessarily see this that often. You can see this more with XTrac, remember the weaker signals we mentioned ? That's giving you incorrect positional data, and can throw your position off by perhaps a couple of feet or more, and this can then fool the application to snapping you to the wrong road. Another problem witnessed by some people is lag. Lag can occur when accelerating and decelerating in extreme conditions, or especially if you have a low sat lock and more weaker signals than stronger signals. SiRF also say in their October 2002 Press Release "The SiRFXTrac software enables the highly popular SiRFStarIIe/LP chipset to acquire, and continue tracking GPS signals at far lower signal levels than is currently possible with competitive autonomous GPS solutions. For the user, this means that GPS can now be used in environments previously deemed inaccessible � environments such as urban canyons, parking garages, dense foliage, multi-level freeways, and, in some cases, indoors. By expanding the number of areas in which GPS can get a position fix, SiRFXTrac will improve existing location-based applications and enable new ones that have been impractical until now." Should I be looking to use an XTrac GPS Receiver ? Well it depends on what you're doing. If you are looking for a better fix, then XTrac could be for you. You will also see benefits with XTrac when you are in an area where you only have a small window view of the sky, or are having difficulties in acquiring satellites. If you're looking to use your GPS Receiver on a daily basis for driving, and don't usually see any signal problems, then XTrac probably won't make much difference to you, and could cause lag when travelling at high speeds causing you to miss junctions turns on the map. XTrac receivers as of the time of writing this article are only available in Compact Flash form, and these type of receivers excel in outdoor situations like hiking, mountaineering etc. It's entirely up to you to decide which will be better, although in our tests with both the SysOnChip CF Plus and the Holux GM-270U, we have only experienced lag when decelerating quickly, and have not been snapped to other roads in town areas. However, because you are constantly bringing in weaker signals, you will see your position on screen move slightly when you are stationary, as more data is coming in to offset your position. Below are six screenshots taken from TomTom Navigator 2. These show a slight offset in positional data with XTrac compared to a regular GPS. The SiRFXTrac high sensitivity software enables the existing SiRFstarIIe/LP chip set to acquire, and continue tracking GPS signals at far lower signal levels than is currently possible with other autonomous GPS solutions. This means that GPS can now be used in environments previously deemed inaccessible - environments such as severe urban canyons, parking garages, dense foliage, multi-level freeways, under bridges and overpasses, and, in many cases, indoors. By expanding the number of areas in which GPS can get a position fix, SiRFXTrac will improve existing location-based applications and enable new ones that have been impractical until now. Regardless of the product, the placement of the GPS antenna is a crucial element to the success of the product. More often than not however, placement options are limited. Because of SiRFXTrac's lower acquisition and tracking thresholds, the antenna can now be placed in locations previously avoided - places like under a persons clothing, inside a vehicle (and not just on the dash), or even embedded within the mobile device itself. If necessary, it can even assist in overcoming the deficiencies of smaller or cheaper antenna solution. One problem frequently encountered by developers is the additional interference generated by the hardware platform that the GPS application is based on (typically found in PDA's). This can effectively reduce the available signal to the GPS receiver - rendering it less effective than it should. By having the ability to utilize much lower signal strengths, SiRFXTrac is highly resistant to the ever present interference and assists in maintaining an acceptable level of operation. Ultimately, XTrac is up to you. Only you can make that decision. XTrac brings in more technology in an ever increasing changing market and does give some very good enhancements to using GPS, but you have to weigh up the pro's and con's. At the moment there are only XTrac GPS Receivers, and non XTrac GPS Receivers, the two haven't been merged, which means you have to decide which one is more useful to you and go with that one. In our tests both Xtrac CF cards have operated extremely well, but there are others in the forums who have had bad results. It is also worth noting that SysOnChip have also said that some of their early beta firmware cards did experience lag, which was fixed in the later chipsets, so if you are looking to purchase cards from dubious sources like eBay, than you may not know whether you are getting an older or new firmware card.